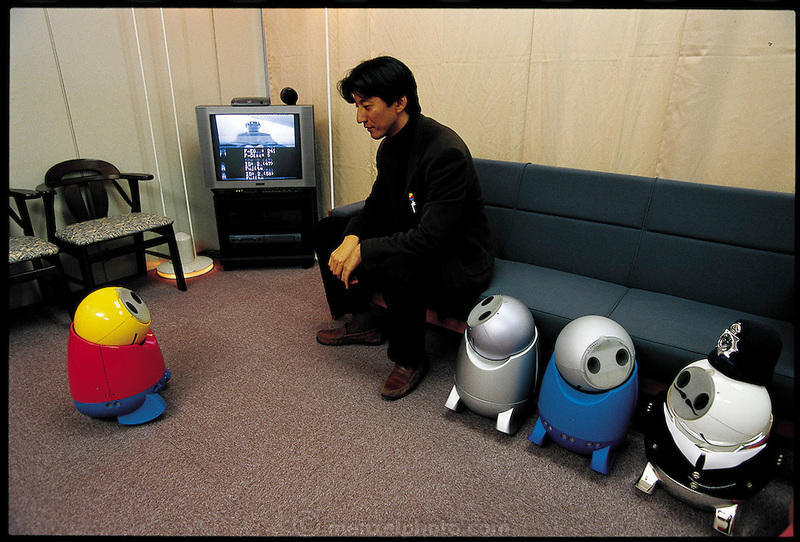 Robot designer Yoshihiro Fujita stares into the electronic eyes of R100, his personal-assistant robot. The robot can recognize faces, identify a few hundred words of Japanese, and obey simple commands, but its most important job, Fujita says, is to help families keep in touch. If Mom at work wants to remind Junior at home to study, she can E-mail the robot, which will deliver the message verbally. To take the sting out of the command, the robot can sing and dance, a charming feature that is one reason NEC is inching toward commercializing the project. Japan. From the book Robo sapiens: Evolution of a New Species, page166-167.